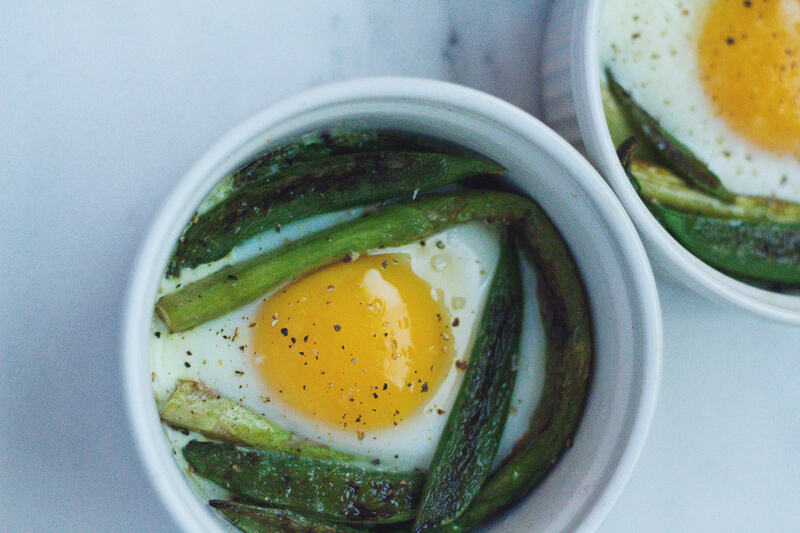 I’m constantly looking for new ways to update my breakfast routine and these baked eggs with snap peas and asparagus fit the bill. 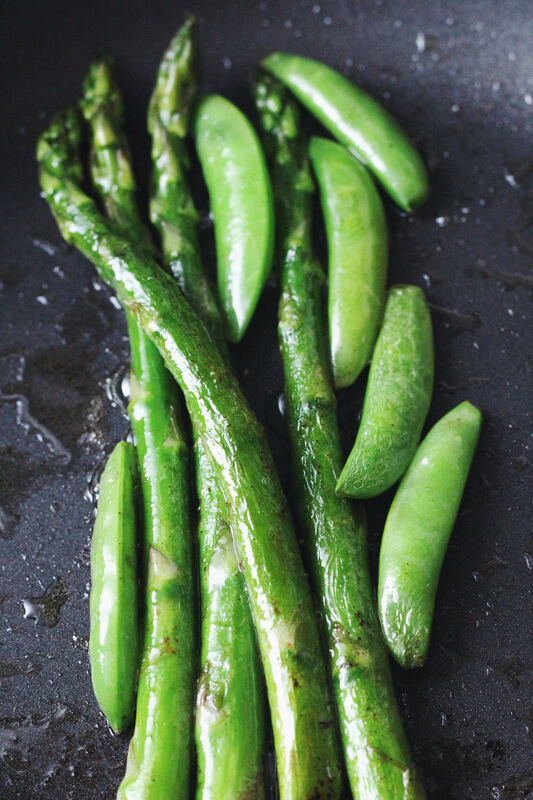 They’re filling, delicious and easy to put together; you can substitute vegetables like peppers and spinach for the asparagus and snap peas, but these are two of my personal favorites, and since they’re abundant and delicious in the spring, I like to make use of them. Serve these with freshly toasted bread and long, savory curls of Parmesan for brunch alongside these for a winning and easy meal. Add a tablespoon of butter to a pan and let it melt. Add the asparagus. Cook until they have softened and are flexible, about 5 minutes. Add the snap peas, cooking until they are soft, about 2 more minutes. When ready, season with salt and freshly cracked pepper. Stir to coat. 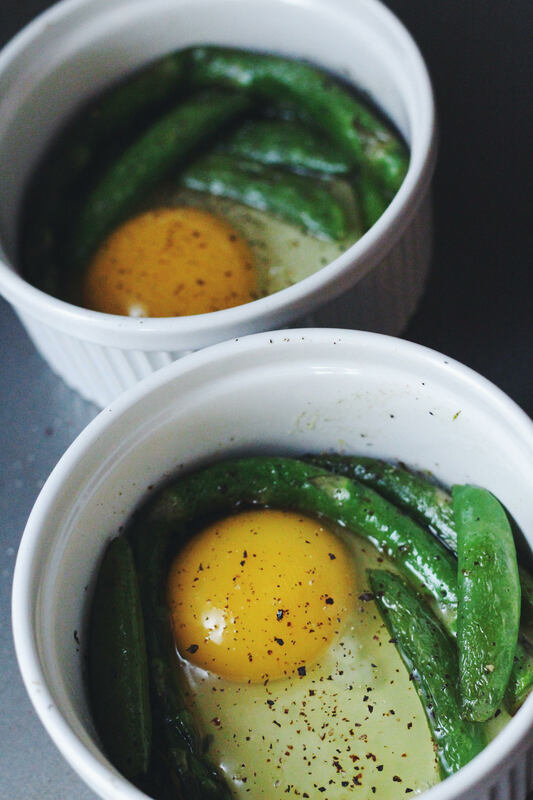 Add the asparagus and snap peas to oven-proof dishes, leaving space in the middle for the eggs. Crack the eggs into the spaces and season with salt and pepper. Bake until the whites have cooked, around 7-10 minutes. Keep an eye on them. Take out of the oven and serve immediately, with a little Parmesan and some freshly toasted bread. 04 May	This entry was published on May 4, 2014 at 4:01 pm. It’s filed under Delectables and tagged asparagus, breakfast, brunch, delicious, eggs, food, healthy, may, photography, recipes, seasonal, snap peas, spring. Bookmark the permalink. Follow any comments here with the RSS feed for this post. Lovely combination of the sugar snap peas, as we call ’em, and asparagus. Hmm, must bake me some eggs as I’ve never done that before. I’m not a massive egg person. But really nice with the asparagus! You could try it with poached eggs as well, I bet it would be delicious! OMG these look so delicious. I love eggs, especially with fresh produce. Simple and delicious. Great photos! Thanks so much! I totally agree, sometimes there’s nothing better than simple eggs and veggies for breakfast!